In a medium bowl, whisk olive oil and balsamic. Add tomatoes, basil and onions; season with salt and pepper. and toss. Set aside at least 10 minutes so the juices combine. Preheat oven to 450°. Place a large baking pan in the oven to get hot. Combine breadcrumbs and grated cheese in one bowl. In another bowl combine olive oil, lemon juice, and pepper. 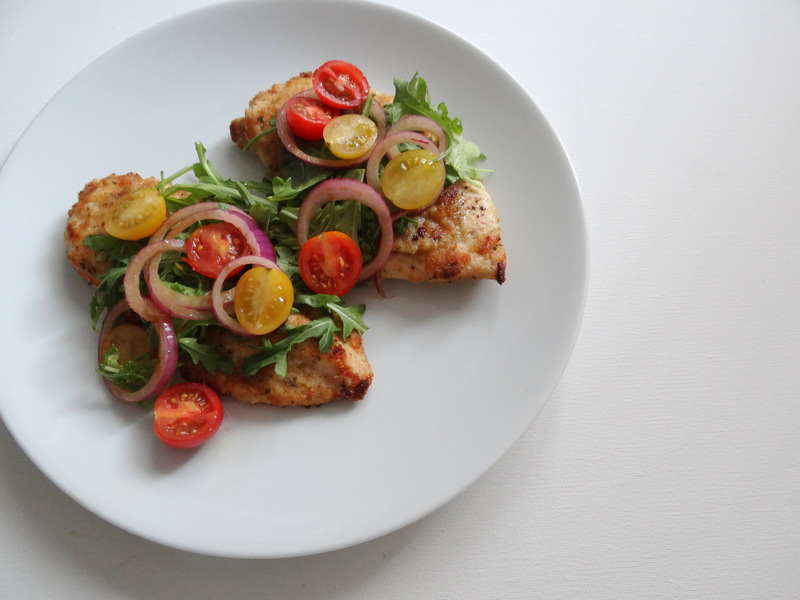 Lightly pound chicken breasts into cutlets, you should have 6. Wash and dry cutlets well with paper towels; season with salt and pepper. Dip cutlets into lemon/oil mixture, then into breadcrumbs, pressing firmly to adhere. Remove the baking pan from the oven and spray with cooking spray. Place the chicken on the baking sheets and spray with olive oil spray on top. Bake chicken, turning once halfway through for about 15 minutes total, or until chicken is golden. Remove from the oven and top with arugula and tomato salad on top.